Bits of My Own: Slowly I creep. . . , inch by inch! Still here working on the rug! Row 39 is the start of the light group of rows. 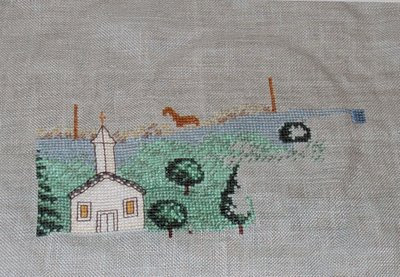 I have just started row 40. . .
Phew! Still have a loooong way to go! In the meantime, I have started a new stitching project. I have had Peace in the Country in my stash for ages. 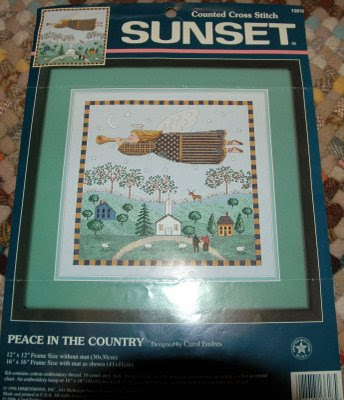 It is actually a kit from Sunset, but I decided to swop out the aida that it came with it, with a piece of 32ct Dove Gray linen. I actually haven't been enjoying it too much so far. It is one of those designs that seems like it was designed by a computer. I am working on the the hills in the background. 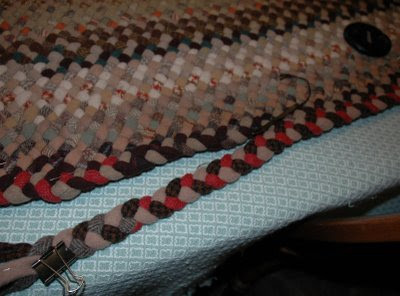 There are many half stitches and many, many color changes. Hopefully I will like it better when I move on to another section. I have made a small start on it. I have been following your progress on your rug with great interest ... it is going to be a real beauty ... you mention the row # your are on, which I suppose is the logical way to measure your progress ... but could you give us a rough approximation of the dimensions ... I remember an earlier photo of the rug overwhelming your dining room table but not knowing how big the table is I don't have a referent for the overall size of your rug thus far. Even so, I am very very impressed. 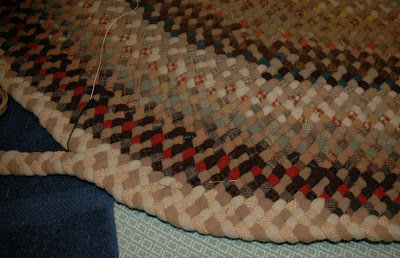 the rug is coming along nicely and great start to the new piece. 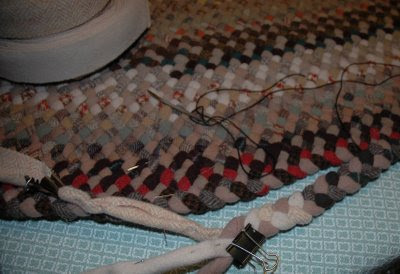 Your new start is looking great...and good for you with your rug making. Very impressive. Thanks for your heart-felt comment on my blog. I really want to go see the new movie "Four Christmases" The couple "escapes" every year from the family Christmas chaos and goes on vacation. Well, this year all the flights are canceled and they are stuck running around visiting EVERYONE. It looks funny and I need a good laugh over this whole situation. You are the winner of the turkey dishcloth!! Please send your complete name and address to sewmanythoughts@hotmai.com . Hope to hear from you soon.